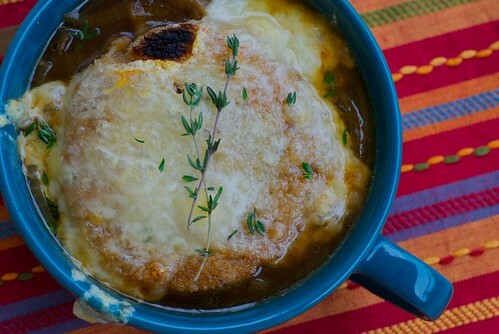 You know what the secret to amazing French onion soup is? Brandy. Next time you make French onion soup, skip the white wine and add brandy instead. You won't taste a strong liquor flavor, but you will notice a complexity and depth of flavor that lingers delicately on your lips. Note: The licorice flavored fennel complements the sweet onions and brandy in this soup. If you're not a fennel fan, then add 2 more onions. For a variation, you can also use smoked Gouda or rye bread. 1. In a large, heavy bottomed saucepan or Dutch oven over medium-low heat, melt butter. Add fennel and onions turning to coat. Cook for 35 to 45 minutes, stirring occasionally. This allows the onions to "sweat" and become meltingly tender, browned, and sweet. Add brandy and cook for 5 minutes until slightly reduced. Add beef broth, salt, black pepper, and thyme and stir. Reduce heat to low and cook for 15 to 20 minutes. 2. Pour soup into individual bowls. Top each with a piece of bread, toasted side down, and top with 1/8 of the shredded cheese. Broil for 2 to 3 minutes, or until browned and bubbly. Serve immediately. sounds like a great plan! Love that soup. Yum, I love french onion soup and always use brandy in it. I've heard cognac is good too. I like where you're going with this! I was just thinking I hadn't made French Onion soup in a long time. This would be a reason to try again! Fennel! Great idea. I use fennel in my cioppino, but never thought to use it in French onion soup (though I do add brandy, and oh boy, is it good). I absolutely agree with you. In fact, I personally don't believe white wine even belongs in a French Onion Soup recipe. You need robust depth to cut through the richness of the beef broth and slow cooked onions. Well done, and great advice. aggie-I believe you! And thanks so much for the RT! Let me know how it comes out. TW-It's one of those dishes that we all tend to forget about till we have it and fall in love all over again. lydia-It's a subtle touch, but worthwhile. culinarycache-Thanks for the thoughtful reply! YES!!! i learned this secret about a year ago and have enjoyed THE BEST French Onion Soup since that day - there is simply no turning back!! I love cooking with brandy but I've never used it in onion soup. I love onion soup and could eat it every week. I'm definitely giving this a try. I love secrets! Exactly what I want to cook and even more truthfully, eat, with today's chilly grey skies looming. I have never made this, though I love it; that's about to change, thank you very much. Outstanding recipe, Susan. I'm not a great fan of onion soup, but with fennel and brandy? I'll bet you'd have a convert. Great photos! I think fennel is the other "secret ingredient" that's been missing the few times I've made onion soup at home. 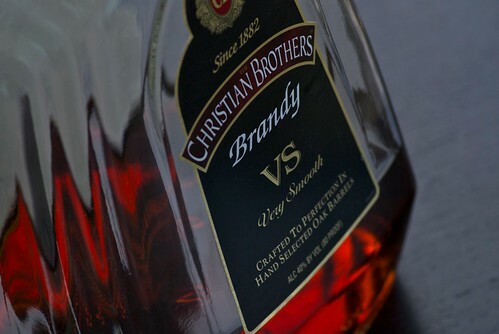 I'm all for the brandy! GFGidget-I'm sure sherry would be lovely. If you make it let me know how it comes out. smith-I agree. I'm a convert. nancie-Oh, I actually love making French onion soup. It's such a sensory experience with the smells and changing colors and textures. You're gonna love it. rosemary-Yes, the fennel snuck in and worked some magic too. I cannot wait to try this recipe! I love french onion soup! Thanks for sharing the secret Susan. I also love the addition of fennel in this comforting soup.